Deep in the arid northern part of Kenya‚ situated across the Great North Road‚ is Shaba National Reserve which forms part of a trio of reserves quite different from the ones found in Kenya. Shaba takes its name from Mount Shaba (1525 metres)‚ a volcanic mountain that became extinct around 5‚000 years ago and lies on the border of the reserve. 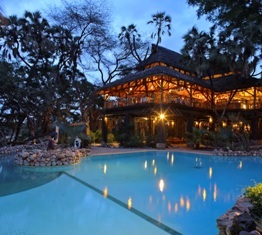 In the middle of this desert of volcanic earth lies Sarova Shaba Game Lodge; Kenya's best kept secret. Built in an oasis around the natural terrain of this breathtaking volcanic desert‚ the Lodge is attractively laid out with chalet style rooms overlooking the Ewaso Nyiro River. Natural spring water has been harnessed to ribbon its way in and out all around the property creating a beautiful landscape. Coupled with the large free-form swimming pool that flows around the lush gardens and tall trees‚ all this refreshing water lends an almost magical feel to this natural oasis. Check in at AIRKENYA'S passenger Terminal at Wilson Airport‚ for your early morning flight to Samburu which departs at 0830hrs or 0915hrs to arrive at Kalama or Samburu airstrip in Samburu at approximately 0955hrs or 1045hrs. You will be met by a lodge representative for your transfer to the magical and luxurious Sarova Shaba Game Lodge which is set along the bank of the Ewaso Nyiro River. A wake up call in the wee hours of the morning signals the start of your day with an early morning game drive. It is an excellent time to view the elephant‚ buffalo‚ lion‚ leopard and the rare species of the reserve. The exciting morning game drive will be crowned by garden breakfast with bubbly which is a unique experience of dining on the sand bank along the river. The breakfast includes live cooking against the backdrop of the Ewaso Nyiro River and Shaba game park. Back at the lodge team up with the naturalist / guide for an informative nature walk or indulge yourself in games available at the lodge which include table tennis‚ badminton‚ water volleyball‚ darts and board games. Enjoy another late afternoon game drive in the reserve which lies on the fringes of the vast and arid desert once known as the Northern Frontier District. Get entertained by traditional Samburu music and dance as you savor your dinner. Enjoy a final game drive before breakfast. Relish a hearty warm breakfst before transfering to the airstrip for your flight back to Wilson airport.